Product prices and availability are accurate as of 2019-04-18 13:56:54 UTC and are subject to change. Any price and availability information displayed on http://www.amazon.com/ at the time of purchase will apply to the purchase of this product. Clusters of goodness in every single bite! A healthy mix of pumpkin and sunflower seeds, coconut, figs, sweetened with a drop of honey, and balanced with sea salt (and a little more). Eat this Nut-Free PaleoKrunch Granola for breakfast, or anytime of the day! With dried, or fresh fruits. Regular milk, almond or coconut milk. Straight up, or chilled for a refreshing treat! The choice is yours, but we know you won't regret this healthy, grain-free option! 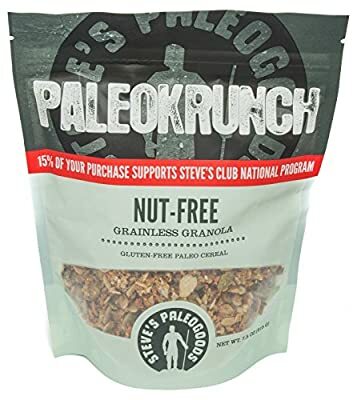 A single re-sealable bag containing 7.5 oz of krunchy granola Each serving of this delicious grain-free granola has 4g of protein, and 5g of fiber! Gluten, grain, dairy, AND soy-free Paleo cereal, lightly sweetened with a touch of honey. Comes in a re-sealable and re-usable container. Perfect 'krunchy' breakfast without the nuts.